Skin lightening creams can be used like hydroquinone, azelaic acid, glycolic acid, tretinoin creams, kojic acid, soy, arbutin and those containing liquorice. But these should be used under strict guidance and as prescribed. 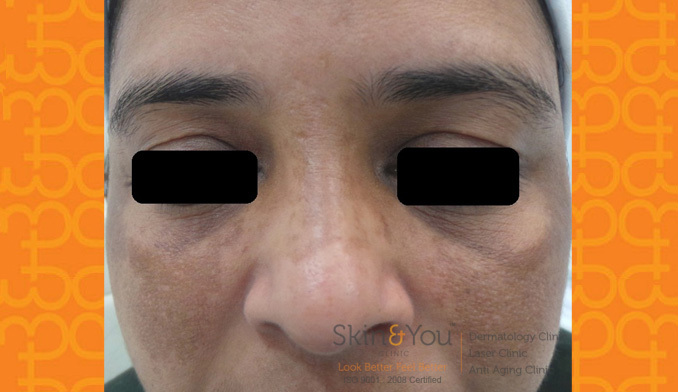 Treatments at skin & you clinic for melasma? Whitening injections – glutathione injections can be injected in the patches and they cause whitening of the area of pigmentation. Why Skin & You Clinic for Melasma and freckles Treatment? Melasma is a difficult condition which requires careful management. Any aggressive treatments can make it worse. At Skin & You Clinic, Mumbai, we specialize in the treatment of Melasma. After establishing the type of Melasma you have and the depth of pigmentation, treatment plans are formulated. We have a wide range of treatments available that are combined with the best technology, customised to best suit your skin type.